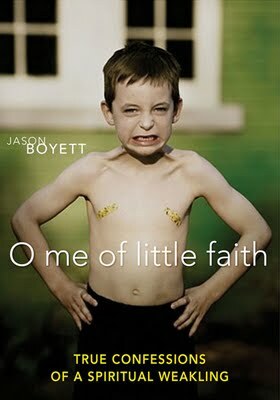 O Me of Little Faith is, as the title might suggest, a book about doubt. It’s a witty, personal, honest-sounding memoir as well as an exploration of the role doubt plays in the Christian life. I found this book through the blog Jesus Needs New PR, by Matthew Paul Turner (of Churched and Hear No Evil fame). Jason Boyett (who has a pretty interesting blog himself) is cut from a similar bolt of cloth as Turner, though with perhaps a little more serious food for thought in his writing. They are both representatives (and not the only ones … watch for another interesting review coming up soon) of a breed of young (by which I mean, of course, youngerthanme) evangelicals who have moved away from more conservative or fundamentalist backgrounds and are able to view those backgrounds with critical and sometimes irreverent humour, but who haven’t left the wider fold of evangelical Christianity. From that perspective, Jason Boyett addresses the question of doubt. While liberal Christians are comfortable quoting statements like “Doubt is the handmaiden of Faith,” you don’t get a lot of that in more conservative churches, including my church, where doubt is at least a borderline sin if not an outright transgression. I love Joshilyn Jackson. Let’s just get that out there. 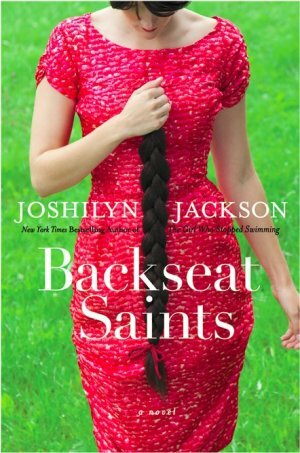 Her books — Backseat Saints is her fourth — are fresh, funny, often dark, thought-provoking, and always infused with a strong, memorable voice. I was hooked from the first sentence of her first novel, Gods in Alabama, and she never disappoints. (She also has one of the funniest blogs anywhere on the internet: Faster Than Kudzu). Each of Jackson’s four novels is a stand-alone story, but Backseat Saints has some links to Gods in Alabama. In Gods, a woman named Rose Mae Lolley appears a couple of times, an obviously distraught character whose personal quest intersects at a few key points with that of the main character, Arlene. Backseat Saints picks up Rose’s own story and explains just what that quest she was on was. And it’s a doozy of a quest. Rose Mae Lolley, now Ro Grandee, is the child of an abusive father and a mother who abandoned her, who has since found her way into an abusive marriage. When a gypsy fortune-teller tells her she has to kill her husband before he kills her, Rose attempts to break free of the stifling life she’s trapped in — which inevitably involves returning to where she came from. 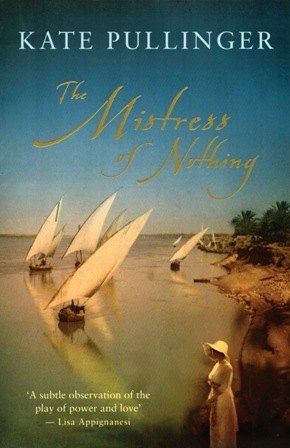 This year’s Governor General’s Award winner for fiction is a beautiful and engrossing historical novel set in Egypt in the 1860s. It’s told from the point of view of Sally Naldrett, lady’s maid to Lady Lucie Duff Gordon. Her Ladyship has been forced by poor health to leave her home in England relocate more or less permanently to a warmer climate. Despite her poor health, she has a spirit of adventure and the curious mind of a scholar, so she chooses Egypt. Sally, whose entire life centres around devotion to “My Lady,” willingly goes along, accepting and enjoying the changes in her life. The details of Sally’s world shift but the centre is fixed: her beloved mistress is always her top priority, and making My Lady comfortable and happy no matter the circumstances is always her goal. Away from the strictures of English society, both Sally and Lady Duff Gordon find themselves loosening up — both figuratively and literally, as they both discard stays and English dress for more free-flowing Egyptian clothes. The boundaries between servant and mistress blur a little too, so that the two of them and their devoted Egyptian servant Omar find themselves eating, talking, and laughing together like friends. But when Sally steps outside the boundaries of acceptable behavior to pursue a secret and forbidden love affair, she is harshly reminded that any appearance of equality between herself and her mistress is illusory. As is the affection Sally believed was mutual — it is entirely conditional, based upon Sally “knowing her place.” This is an intimate and personal novel, but also a novel about much bigger issues, primarily the issues of social class and the clash of cultures. When I first heard of this book (in a review in Oprah magazine, where the author has also written articles I’ve enjoyed), I was sure I would love it. It’s another of those “my year of adventure” memoirs, but the premise here was really interesting: cancer survivor Rich goes to live in India for a year to learn Hindi. Given my love for memoirs, and for India, and for “how I found myself in an unlikely place” stories, I figured this was a definite favourite. I did enjoy the book, but not nearly as much as I’d expected. Lots of interesting things happened to Rich during her year in India and she met a variety of interesting characters there, but something about her writing distanced me from the experience rather than drawing me in. 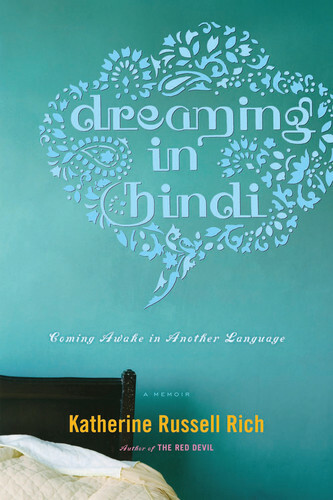 For one thing, she spent a lot of time talking about the theory of second-language learning, which was obviously central to what she wanted to explore in the book, but was less interesting to me than the personal-memoir parts of the story. Another problem is a purely personal issue I had with the way she wrote. I’m sure it was just a matter of style and another reader might have found it quite engrossing, but something in Rich’s tone, the way she describes people and events, made it hard for me to remember who was who or to follow the narrative, so that my interest was never as engaged as it might have been. I still think this is worth reading, and for a reader with a different set of preconceptions and preferences, it might be the perfect book, especially if you like memoirs and travel writing or if you have a particular interest in how people learn languages. But for me, it won’t make the list of my favourite memoirs of 2010. 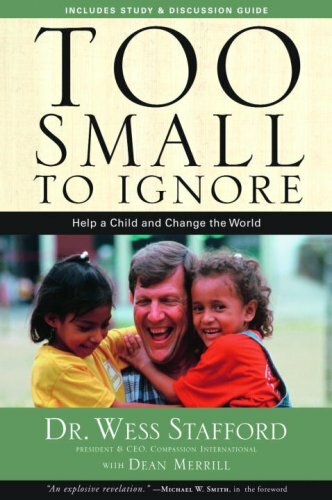 Too Small to Ignore is a book about the importance of children, from a Christian perspective. Compassion International founder Wess Stafford argues that children should be a top priority for every Christian and for every ministry — from our own children in our homes, to children in the developing world. He argues that most churches and ministries put far too few resources into caring for children, even though nothing has a bigger impact on the future. The “theoretical” parts of the book were fine, although nothing particularly startling or new there — Dr. Stafford is preaching to the choir as far as I’m concerned. The parts I found truly interesting and moving were where he illustrates his points by talking about his own experiences as a missionary child in West Africa — contrasting the warmth and acceptance he found in his village community, with the harsh abuse he suffered at a church-run boarding school for the children of missionaries. The fact that his personal experience backs up his beliefs makes what he has to say worth listening to. Dragon Haven is the sequel to Dragon Keeper, which I read and reviewed fairly recently. Robin Hobb is another of the trusted few writers who never lets me down, but I said at the time that I doubted even she could write a book focused mainly on dragons and keep my attention. I was definitely wrong about that! By the end of Dragon Haven, I was viewing the dragons’ story as not just a tolerable interruption to the fascinating human story, but an intriguing plot in itself. 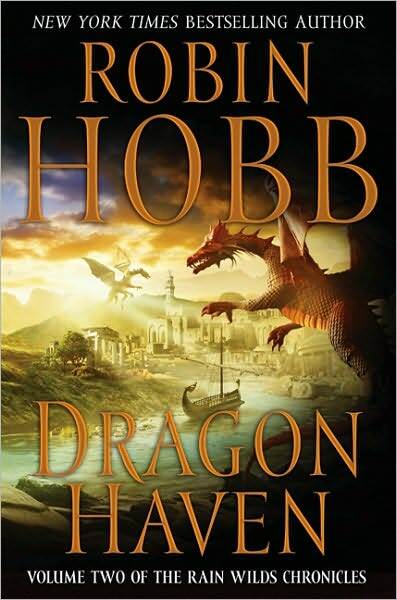 So, Robin Hobb, besides all her other talents, is now the only fantasy writer in the world who can make me care about dragons! This book continues the tale of the dragons, their keepers, and the crew of the barge Tarman, travelling up the Rain Wild River in search of the possibly-mythical lost Elderling city of Kelsingra. While I loved the place the story had brought me to at the end of this book, there was still a lot to be resolved, and I immediately went online to find out when the final volume of this trilogy would be coming out — Hobb has written four trilogies so far, so I didn’t think she’d break the patter. Imagine my shock upon discovering that Dragon Keeper and Dragon Haven were originally written as one book and published as two, and that while there is a sequel coming eventually, Hobb’s not even finished writing it yet!!!! I’m not sure how long I can wait to find out the fate of dragons and humans and the quest for Kelsingra … so hurry up and write, Ms. Hobb!! I’ve always been a big fan of Michael J. Fox, but never more than since he had to retire from acting due to the increasing difficulty in managing his Parkinson’s symptoms. I really admire him for coming out of the disability closet when he did and talking openly about his illness and the impact it has had on him. There’s nothing particularly new or attention-grabbing about the writing in Always Looking Up, but it’s fresh and comes across as honest and sincere — and often funny. 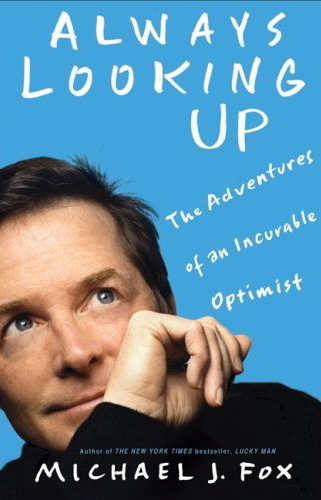 This is a sequel to his first memoir, Lucky Man, and talks about the ways Parkinson’s Disease continues to impact his personal, professional and family life, as well as his growing political activism (mainly focused around advocating for stem-cell research). It was well worth reading and I thoroughly enjoyed it.